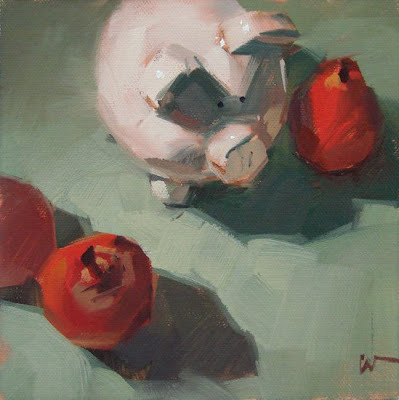 Carol Marine's Painting a Day: "Passing Through"
I love this pig. It was a good day when I found him. I had some trouble this time with the leg you can see. I got all the way through and realized it was in the wrong spot so I had to move it. Sometimes (as with this situation) I think it's best to just completely wipe out the "affected" area and redo it from scratch. Otherwise one risks getting major mud. O.K. 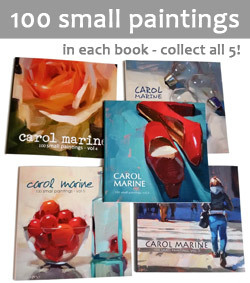 Carol, I have a feeling I am going to want to start a collection of your paintings with this pig! How charming! His little foot sticking out makes him look like he is strolling through the maze of pears! Where is he going? He is on a mission, isn't he? I dig the pig. It's a great shape and it has personality. You're right about scraping off the part that's not working. If it's wrong. It's wrong. This little piggy went to market... to buy some pears.